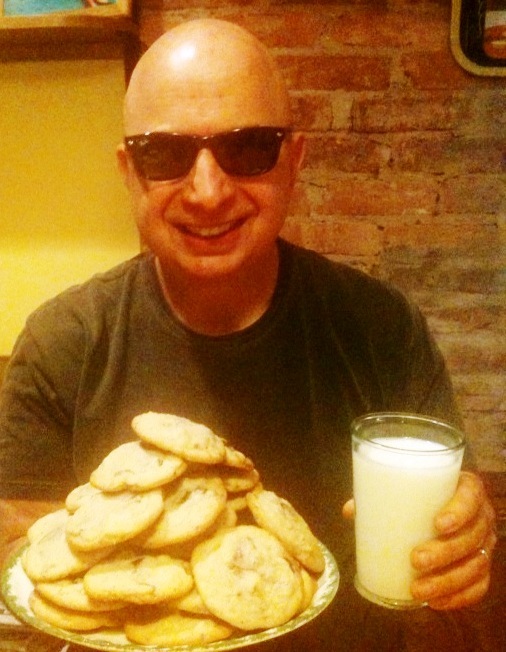 When DH was growing up, he was never allowed more than three cookies at a sitting, so one of the things he likes best about me is that I don't say anything if he has four. In fact, I'm flattered! He was especially pleased with this past weekend's baking adventure. 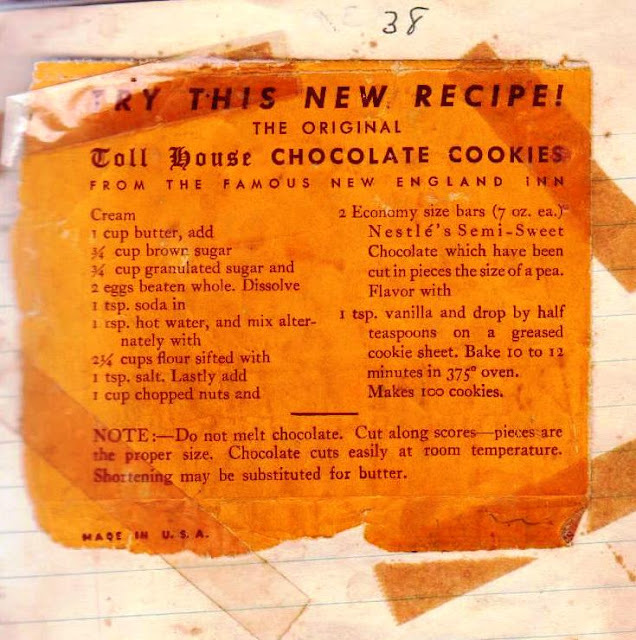 I discovered a tattered brown spiral composition notebook, purchased at an Indiana flea market, its pages filled with a treasure trove of recipes from the 1930s to the 1950s, including the one above, on page 38, with the invitation to "TRY THIS NEW RECIPE." They didn't have to ask me twice. It's for the famous Toll House chocolate chip cookies, before they were famous. The recipe is nearly identical to the one printed on millions of Nestle semi-sweet morsel bags, except when this recipe was introduced, there were no morsels. Home cooks were originally instructed to purchase two 7-ounce "economy" size Nestle's semi-sweet candy bars and break them into pieces the size of peas. Putting pieces of chocolate into batter was so unusual back then, that a special note at the bottom of the recipe reminds bakers NOT to melt the chocolate. Since I couldn't find any Nestle semi-sweet chocolate bars (do they even exist? 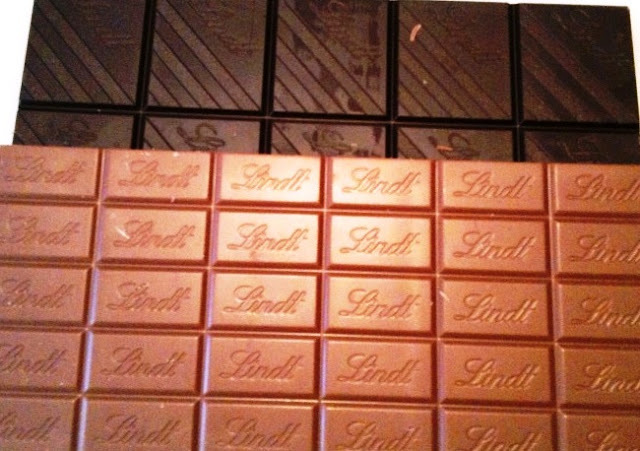 ), or even any semi-sweet chocolate that I thought was worth eating, I used a combination of Lindt Excellence, a dark chocolate, and Lindt milk chocolate. I mean, doesn't dark chocolate and milk chocolate equal semi-sweet? The cookies were invented in the 1930s by Ruth Wakefield who, with her husband Kenneth, owned the Toll House Inn in Whitman, Massachusetts. Legend has it that while preparing a batch of Butter Drop Do cookies, Ruth cut a bar of Nestlé semi-sweet chocolate into tiny bits and added them to her dough, expecting them to melt. Instead, the chocolate held its shape. The new cookies became quite popular; the recipe was published in a Boston newspaper and sales of the chocolate bars soared in the northeast. 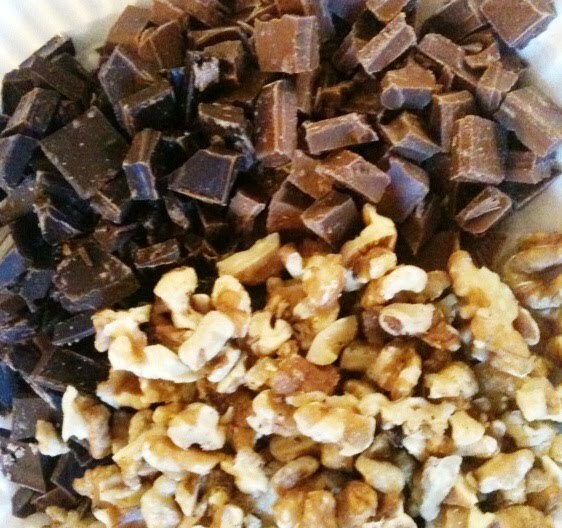 In 1939, Nestle introduced chocolate chips, so home bakers no longer had to chop their own chocolate. Of course, in the past couple of years, the trend toward chocolate chunk cookies has emerged, an unusual return to the recipe's first incarnation. Chocolate chip cookie baking is one of the great pleasures of childhood and adulthood, for that matter. Two things make it much easier: always start with softened butter and invest in a small ice cream scoop. 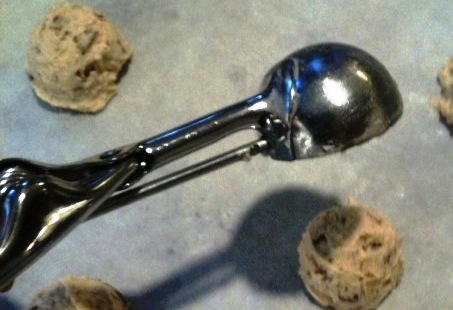 With the scoop, it's a snap to shape the cookies perfectly and without the messy ordeal of scraping the dough off spoons and onto the cookie sheet. DH, pictured with a whole plate of cookies, wants everyone to know that he only had two. But he could have had as many as he wanted. Yummy...I love the idea of this blog...and old cookbooks. I have a HUGE collection of cookbooks. 100's. really. When I kept them at my dad's summer house, my mom built bookshelves for them, and dad put extra support posts in the basement. books are heavy. The true funny story of the library building (Yale or Princeton) where they designed a beautiful new library buidling...but the architects failed to factor in the weight of the books in the construction, it was dubbed unsafe and they had to use the new building for another purpose and rebuild another library. @Margaret: Too funny. I guess you can have a cookie but just water the rest of the day? @Tribeca mom: So glad you found me, and I'm envious of your HUGE cookbook collection (though not the extra supports that they need!) Do you have a favorite?